Southwest started selling flights to Hawaii from Oakland and San Jose last month, with much fanfare. The $49 fares did not last long as the hawk-eyed future vacationers snatched up tickets quickly. Only, Hawaii on Southwest was not available for all hawk-eyed vacationers, particularly those in the Midwest or East Coast. As discussed in this USA Today article, passengers east of the middle of the country could find flights to Hawaii, but there were no available flights from Hawaii. This created a frustrating one-way situation that the traveling public is not used to seeing. Southwest making the bet that no Baltimoreans actually want to return from Hawaii. As industry readers are aware, this is entirely due to Southwest’s lack of red-eye flights. While not a new limitation for the airline, stretching the three additional time zones to Hawaii does expose their potential customers to unique frustrations. You can get to Hawaii, but you can’t get back. This week, we look at why this problem exists, and just how much of an imbalance it creates for Southwest. Southwest’s operating day begins at 5:00 am and ends with no flights scheduled to arrive after 1:55am local time. This creates a 21 hour day for the airline. With the breadth of Southwest’s network spanning only three time zones, there was enough over-lap of the operating days to allow full schedules in both east-bound and west-bound directions unencumbered. However, with the addition of Hawaii, Southwest’s network now spans six time zones; a situation where both time and distance begin working against each other. With Southwest limiting the window of their operating day to exclude overnight flying, it creates two very different operational situations dependent upon direction of travel. A 21 hour day started on the East Coast and flown through the network to Hawaii will result in 27 hours of available flying. 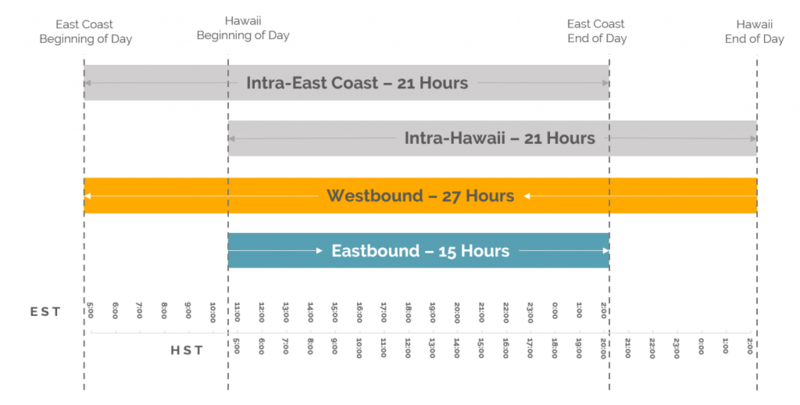 Conversely, a 21 hour day started on Hawaii time and ending on Eastern time means only 15 hours are available to fly and make connections eastbound. Consider that Southwest doesn’t depart their mainland-bound flights from Hawaii until 9:10, four hours later, and you’re left with less than 11 hours to fly from Hawaii to the east coast, an improbable task that would require a connecting flight scheduled to depart withing 45 minutes connection to pull off. The difference in available connections westbound versus eastbound is apparent in the above maps. There are significantly fewer opportunities to travel east from Hawaii on Southwest than there are to travel west. This imbalance is typically resolved by the use of red-eye flights which take advantage of the shorter night eastbound to make early connections. Without that capability, it leaves Southwest with a unique imbalance. Further to this imbalance visible to the passengers, it creates a challenge for Southwest in local and connecting traffic flows. Since westbound traffic is flying with the clock, they have two flights available to build connections. However, the eastbound flights against the clock limit any material connections to the morning flight only. This creates a revenue management challenge where the later afternoon flights will rely more on local traffic, while the morning flights will likely be filled with connections all piling on the only flight home. In every instance of a very un-scientific look at HNL-OAK fares through Southwest’s website, this does indeed seem to be the case with the early flight either selling for more than the late flight, or being sold out altogether. Of course, this creates other challenges for Southwest, namely aircraft rotations for which intra-island flying becomes an opportunity. Their entry into the market has also driven up hotel prices which, while good for the hotels, changes the overall equation for the passenger. A $200 lower air fare could quickly be eclipsed by a $500 more expensive hotel room. Still, this is the price of stimulating a market, and is a good problem for Southwest to have. Through all of this, Southwest is still filling their flights to Hawaii, connecting imbalance or not. It’s not as though this was an unknown consequence to the Southwest network planning team. They knew their limitations and believed they could overcome the inability to take the eastern half of the country to Hawaii. The full flights suggest they were right. It is also still possible for passengers to create their own eastbound itineraries from Hawaii by spending the night in OAK or SJC; a challenging scenario considering the cost of airport hotels in those two cities. There is a good news ending to this story. While I, too, struggled to find a flight to (and from!) 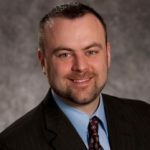 Maui to take advantage of Southwest’s introductory fares, American was busy matching fares in response. I was lucky enough to nab a $278 fare from DFW to OGG, non-stop. The return flight? A red-eye.